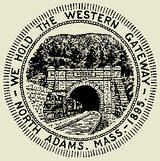 Adams and North Adams were one town until 1878. They both began as East Hoosuck Plantation which was first surveyed in 1739 by Nathan Kellogg. Fort Massachusetts&apos; fall in 1745 discouraged settlement of the northern areas of Berkshire County until after the French and Indian War. East Hoosuck was sold to Nathan James, Eliza Jones and John Murray as proprietors for settlement in 1762. 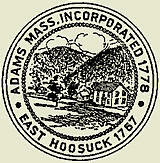 It was incorporated as Adams in 1778, named after Samuel Adams of Boston. Early settlements occurred on each side of the Hoosic River along Notch Road, Friend Street and West Road on the west, and East Road and Bowen’s Corners on the east. During the eighteen hundreds it was a rapidly growing textile mill town. Even with the division of Adams into two townships in 1878, they still became the second and third largest communities in the county. North Adams, the second largest community in Berkshire County, was an industrial part of Adams until 1878 when the two were separated. The area was originally laid out in 1739, and was resurveyed and divided into house lots in 1768. Fort Massachusetts, built in 1744 below the junction of the Upper and Lower forks of the Hoosic River fell to General Vaudrevil's 900 French and Indians in the summer of 1745. Textiles became the major industry of North Adams beginning in 1799 with a fulling mill. In 1801 David Estes built the first carding and cloth dressing mill on the north branch of the Hoosic. Substantial growth in the layouts of the early mills occurred between 1830 and 1845, and by the late 19th century, the Freeman Print Works, the Sampson Shoe Company, and H. Arnold & Company were the largest employers. North Adams grew to be the commercial and industrial center of North Berkshire. The cutting of the Hoosac Tunnel (1851-1875) provided more direct rail service to the city. Considered one of the great engineering feats of the 19th century, it cost $21,241,842. and 196 lives, and took twenty two years to complete. Its construction might have taken longer if not for the first commercial use of tri-nitro-glycerine in blasting the tunnel. It is on the Historic American Engineering Survey and the National Register.